Late 1998, BridgeClimb commenced operations hosting guided tours to the top of one of Australia’s most famous engineering icons, the Sydney Harbour Bridge. The climb, which many tourists rate as one of the most memorable attractions in Sydney, is not for the feint-hearted, reaching 134 meters above Sydney Harbour. Naturally, the safety of both staff and tourists is of paramount importance. As well as ensuring that there is no possibility of danger to climbers or those below, other factors that also had to be taken into account. Weather conditions on top of the famous “coat hanger” can vary considerably from those on the ground. Due to this, accurate weather information from the summit had to be made available to the BridgeClimb team in real-time at their operational headquarters. 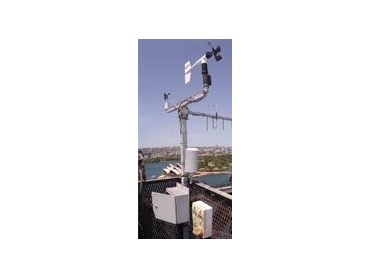 In 2005, Campbell Scientific Australia were approached to provide a reliable, cost-effective solution for providing weather monitoring equipment, associated software, communication equipment and computer displays of the current weather conditions on top of the bridge. Campbell Scientific’s smallest data logger, a CR200 was selected for the role. An RM Young 05103 Wind Monitor measures wind speed & direction while a Vaisala HMP45C measures RH and air temperature. This equipment is installed at a point on top of the bridge known fondly as Blinky Bill, a small landing supporting an aircraft hazard warning light. The equipment runs from an AC power supply with battery backup. Data is transmitted to BridgeClimb’s operational headquarters at the base of the bridge using a pair of Trio 450MHz radios and a Yagi directional antenna. Updated information is provided by radio every minute while weather information is automatically updated on BridgeClimb’s webpage every half-hour. The data is collected using Campbell Scientific’s Loggernet software and presentation is handled by RTMC, the graphical display module of Loggernet. The data is presented in multiple different formats – delivered to the Climb Operations & Safety Team, updated on the BridgeClimb web site, and also presented on monitors in the foyer.